It’s summer even in the UK and a book-buyer’s passion turns to frozen desserts and all things deliciously cool. 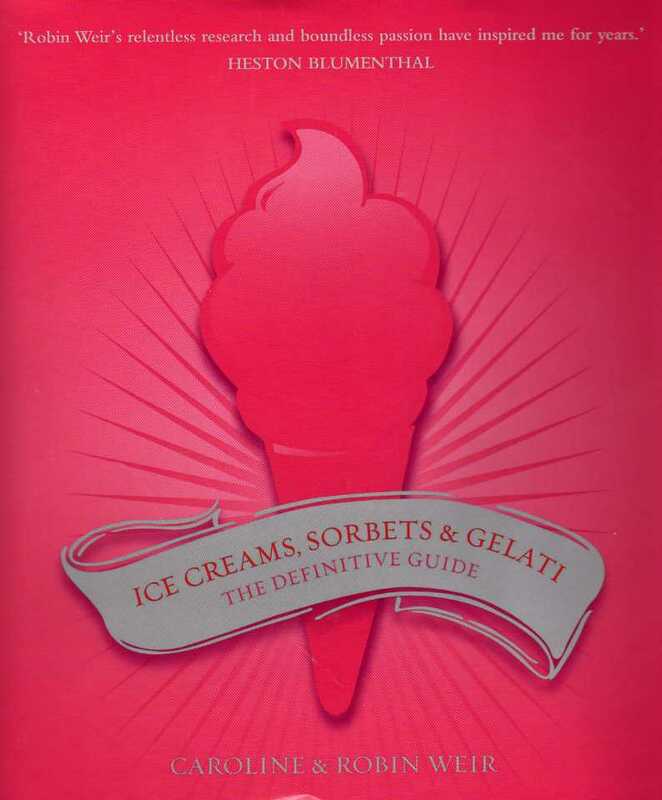 Ice Creams, Sorbets and Gelati is a huge tome and amazing value for money. It offers more than 300 large-format pages, over 400 recipes, iconic illustrations, ice cream lore and information on one of the world’s most popular food groups. The progress of ice cream has taken it from the sublime to the ridiculous and back again. It was once the preserve of kings, emperors and the very wealthy. The secrets of its manufacture became more widely known and the raw materials became more reasonably priced, resulting in an inferior and often unhygienic product being made available to all. Penny Lick glasses filled by unscrupulous vendors and enjoyed by one eager buyer were returned unwashed and filled ready for the next victim. Several epidemics of fatal diseases have been attributed to the practice. Laws were tightened to give ice cream lovers a sporting chance at long life, and then the boom was in full swing. These days we enjoy good quality frozen desserts along with an even larger choice of shoddy goods, but at least many of us have the opportunity to make some truly delightful ices at home. The best and freshest of ingredients are used, and these ingredients are few and, for the most part, readily available. Plenty of history here and it’s amusing and fascinating but you will likely buy this book for the recipes. They are a fine and eclectic bunch and there is truly one for every occasion and every taste, including a few savoury examples (although they are not my favourites). I have been particularly taken by some ices that would be a perfect end to those enormous holiday dinners. Decadent but full of festive flavours. Cranberry Sorbet is tangy and refreshing. Good for a dessert or a digestive between courses. Terry’s Chocolate Orange Ice Cream is bound to revive childhood memories for those of us who only had those chocolate novelties as a Yule-tide treat. Crème de Marron Ice Cream is the ice of choice for those having a Continental Christmas. Mincemeat Ice Cream has become popular over the last few years but this book suggests an alternative which might be even more appealing: Christmas Cake Ice Cream. This honestly does contain Christmas cake, although omitting the icing. This might not be the lightest ice around but it will offer a hint of tradition. My pick of this book isn’t a seasonal delight but an intriguing confection of, well, confectionery. Werther’s Ice Cream is made with Werther’s Original Butter Toffee (candy). Those melting and moreish sweets are put to good use in this recipe which produces a rich dessert that is bound to become a regular in those colder months. Ice Creams, Sorbets and Gelati is a winner. The weather is hot and our thoughts turn to cold treats. This could be a welcome present for those with an ice-cream machine, for those who aspire to such a thing, and for those who love frozen desserts. The recipes here are inspiring and simple.